This explosive eruption at Kilauea on May 22, 1924, watched by anthropologist John Stokes, left, and geologist Harold Palmer, was photographed by Tai Sing Loo. Geologist Harold Stearns calculated the cloud was 2 miles high and still rising. Geologists now believe such explosions were common in the past. HILO » Geologists at Hawaiian Volcano Observatory are referring to a "revolution" in their understanding of the explosive nature of Kilauea Volcano. Although explosive eruptions at Kilauea in 1790 and 1924 were known, the volcano has been considered generally peaceful, even when it erupts. That was one reason geologist Thomas A. Jaggar chose Kilauea, out of sites around the world, to create a volcano study center in 1912. Now geologists are realizing that Kilauea can be much more explosive than previously understood. Kilauea appears to have explosive eruptions about as often as Washington state's Mount St. Helens, which produced the devastating explosive eruption of 1980. Although erupting as often as St. Helens, Kilauea's blasts are generally smaller yet occasionally deadly. The new view of Kilauea is outlined in a two-part series in the observatory's weekly Volcano Watch column starting this week and on the observatory's Web site since last August, said observatory head Jim Kauahikaua. The descriptions were written by Don Swanson, former head of the observatory, based on his studies. Swanson is currently in Ecuador. 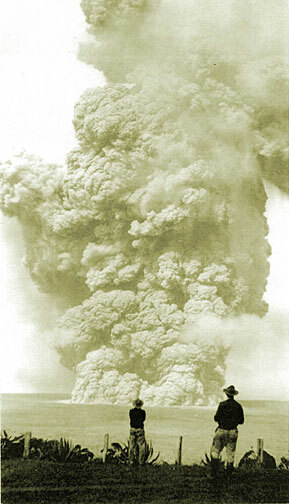 An explosive eruption is one that throws solid rock, with or without liquid lava, Swanson wrote. That means the high lava fountains on Kilauea's east rift from 1983 to 1986 were not explosions. A well-known explosive eruption happened in 1790, killing 80 to 800 members of an army loyal to Chief Keoua. That was long viewed as a rare event. Then new evidence piled up. Geologists found layers of volcanic ash piled on top of each other, each consisting of material blasted out of Kilauea. Some pre-1790 rocks as big as 10 pounds were blasted four miles. The 1924 explosion shot out a rock weighing 13 tons. Some of the pre-1790 layers had Hawaiian structures between them, covered by later blasts. Radiocarbon tests showed these layers were deposited repeatedly starting about 1490. As even older layers were studied, a new view of Kilauea's explosiveness began about five years ago, then picked up speed just 18 months ago, Swanson wrote. The new understanding doesn't necessarily mean greater danger. Explosive eruptions occurred on the east rift in 1987, 1991 and 1996, and few people noticed aside from geologists. Kilauea isn't more dangerous, Kauahikaua said. "We're just recognizing another threat that Kilauea has always had," he said. HILO » Explosive eruptions at Kilauea may be news to geologists, but Hawaiians would have lived through them and perhaps made up stories about them. Hawaiian chants tell of the volcano goddess Pele throwing rocks at the pig-man demigod, according to geologist Don Swanson. Pele is certainly considered to have an explosive temper and throwing rocks may indicate an explosive eruption, he wrote. University of Hawaii-Hilo Hawaiian language professors Kalena Silva and Larry Kimura both wanted to see the original wording of the chant in Hawaiian before they agreed with Swanson's association of the ideas. "I think there might be some truth in that," Silva said. Describing a natural phenomenon in story form would not be unusual in Hawaiian culture. Ancient Hawaiians had no separate word for lava flows and instead referred to them as "pele," Hawaiian elder Emma Kauhi once wrote. Copyright © 2005 StarBulletin.com. All rights reserved.